Early in the campaign I thought Trump was displaying some linguistic and behavior patterns that were troublesome. I don’t mean this to be snide as if I were calling him “crazy” just because I didn’t vote for him. I generally thought he exhibited a linguistic word salad that was indicative of certain cognitive disorders. It looks more and more like this might be an accurate assessment. But my concerns are not clinical as much as they are worried about the stability of the government. At one time a citizen could feel confident that there are enough people around the president to handle any problems and make a smooth transition to someone else if necessary. Or, the advisory staff was capable and competent. But in Trump’s case we have people like Steve Bannon who are enamored and believe in crackpot theories of how the world is going to unfold. Bannon is a self-styled intellectual in the tradition of Trump’s exaggerations, lack of evidence, and the belief that anything he says must bring it into reality. 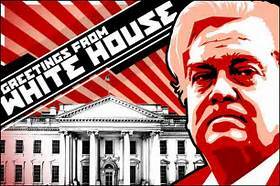 Bannon is a devotee of a book titled “The Fourth Turning” by William Strauss and Neil Howe. According to a number of newspaper reports he has read it numerous times and keeps a copy handy. Now, Strauss and Howe are interesting fellows in their own right but we will let that be for the moment in order to take a look at their generational theories, alarmist prophecies, and catastrophic outlook that will reorganize the global order according to Bannon. The man who sits next to the President of the United States, the man who President Trump believes to be prescient and forward thinking believes that the history of the world is divided up into predictable cycles that repeat themselves, and United States is just short of entering a cycle that will be catastrophic or revolutionary. The book reads like an end-of-days warning about an apocalyptic end. I read the book because I wanted to know what Bannon and others saw in this vision. The book turns out to be rather shallow and repetitive, constantly looking for any chance it can find to organize something into four phases, or see some cyclical relationship. There are qualified and respected historians that are called “cyclical theorists” meaning they believe in cycles of history (e.g. Marx, Toynbee). But there are scholars who have the credentials to make such statements and sound arguments in support of repetitive phases of a culture. Strauss and Howe are reaching to make interpretations that are less than justifiable and in some cases don’t even make any sense. I would also add that “cycle” theorists in history such as Karl Marx and Toynbee have little standing in contemporary scholarship. According to The Fourth Turning history proceeds in cycles of about 80 years and can be divided into four phases. 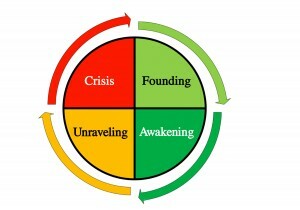 So, in the US the four phases are like the seasons of the year: a spring-like “high” (postwar America), the summer awakening and spirituality (the 1960s), autumnal alienation (the Reagan era), and finally the wintery crisis that is a transformational event that sweeps out the old order. There is more to the theory along with other cycles but I think you get the point. Strauss and Howe are still chasing the dream of finding a complete scientific theory of history when, in fact, modern historians are more micro then they are macro with respect to the artifacts of history and what they mean. The sense of determinism is one of the most disturbing things about Strauss and Howe. If they would’ve noted some repetitive patterns in history and simply argued for their presence they might have presented us with a relatively interesting volume. But the notion that these cycles are godlike in their surety and ability to predict the future is a little unsettling. There is nothing wrong with the notion that some cycles or patterns exist but they are subject to the influences of multiple natural and historical forces that make them unpredictable. Remember, that true believers tend to fall in love uncritically with some seductive idea. Get to know the idea before you are influenced by perfumed thoughts and alluring possibilities. Posted on May 2, 2017, in Communication and Conflict Resolution and tagged Trump. Bookmark the permalink. 1 Comment.